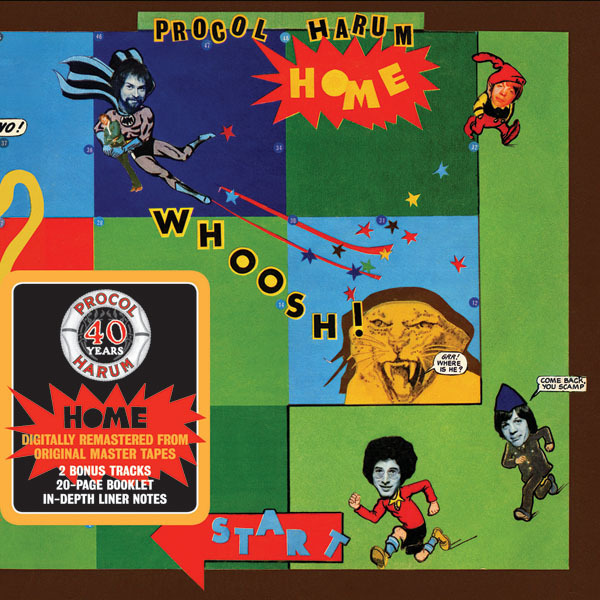 Procol Harum’s fourth album, Home, was released in June 1970 and was a much darker offering than what had gone before. This is depite the band perhaps being at their most optimistic and upbeat during the recording, buzzing off a new lease of life as a four-piece and the formation of their own music publishing company. Nevertheless, maybe the fact they’d never found the album success they truly deserved was playing on the minds of Gary Brooker and Keith Reid when the songs for Home were written. This blacker shade of dark manifests from the off, with the uptempo rocker Whisky Train, an ode to giving up the demon booze, followed immediately by the horror movie imagery of Dead Man’s Dream, a song reminiscent of The Crazy World of Arthur Brown in places, and one that John Peel found to be so disturbing, he asked them not to play it during one of his Radio 1 sessions in 1970. The terrifically misanthropic Still There’ll be More contains the immortal line: “… I’ll blacken your Christmas and piss on your door…”, before things slow right down for the moving lament that is Nothing that I didn’t Know, regarding the unspecified death of 26-year old Jenny Droe. This theme of death continues with About to Die and Barnyard Story (“… I was living in a graveyard, maybe death will be my cure …”) before the rousing Piggy Pig Pig leads us to the album’s undoubted highlight, the epic Whaling Stories. Returning to the nautical theme touched upon on the previous album, the wonderful A Salty Dog, Whaling Stories is an unheralded, progressive masterpiece, impossible to pin down to any particular style as it changes to something else with each verse, shifting seemlesly [sic] towards the operatic, choir-sung finale, over the course of its eight minutes. Your Own Choice rounds the album off nicely on a much lighter note than what has passed before and features a whimsical blast of harmonica from the mouth-organ maestro himself, Larry Adler [this error comes from the liner-note, not the reviewer]. The Fly Records reissue features only two bonus tracks this time around – all that the band would agree to – which are raw backing tracks of Still There’ll be More and Whaling Stories, taken from early on during both songs’ recording sessions. The booklet is once again a peerless feast of photos and info, including interviews with the band members. Worth a look is the photo of a Dutch Procol Harum compilation from 1970, which blatantly rips off The Beatles’ cover for Let it Be. Home runs A Salty Dog close for best Procol Harum album and bears a thoroughly deserved Head Full of Snow recommendation for its undoubted, and dark, magnitude. Sadly it’s also the last of Fly’s reissue collaborations with Salvo records, with Strongman Records taking up the mantle for the remaining albums. Hopefully they’ll maintain the standards in presentation and sound quality that has already been set.